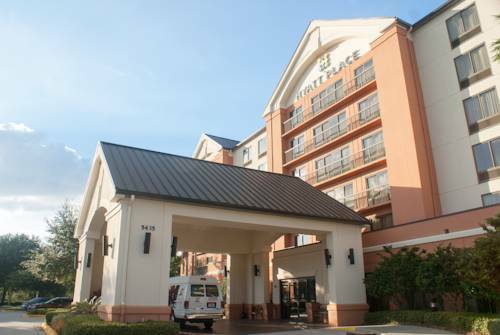 Located 1.5 miles from the Orlando International Airport, Hyatt provides one the most convenient locations. Well-placed near major attractions, the hotel is 20 minutes from Universal Studios and 25 minutes from Walt Disney. Complimentary a.m. Kitchen Skillet, featuring freshly prepared breakfast sandwiches, waffles, French toast, pancakes and oatmeal, available daily. Located 6 minutes 1.5 miles from the Orlando International Airport. Cancel by 4pm 24 hours prior to arrival. International shopping experience featuring over 260 stores such as Nordstroms, Lord and Taylor, Dillard's, and Burdines. In addition, there are over 30 fine restaurants and eateries to choose from. NASA tours Daily. Dine with an astronaut. Outlet mall offering over 110 designer retail stores. Take a step back to the early days of surfing! Theme park destination offering Universal Studios, Islands of Adventure, and the nightlife of CityWalk. Thrilling Water rides and Kid's Park.